Around Podere La Felicita you will discover an utterly unspoilt selection of tantalising villages such as Palaia, the 'capital' of this area, Peccioli with its 2 piazzas and Romanesque architecture, Lajatico just for its wonderful atmosphere or Bientina famous for its antique shops. 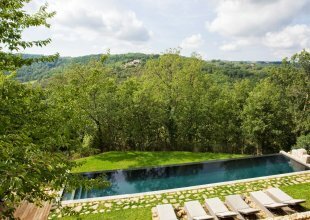 Podere La Felicità, originally a ramshackle farmhouse hidden away in a topographical Tuscan nook has been transformed into a smartly set up, elegant holiday home in an area that is as famed for its scattering of satisfyingly authentic medieval hilltop towns as any part of Chianti. The ground floor living space of this villa offers a large drawing room with open fireplace, comfortable sofas and armchairs. This large flowing space with its beamed ceilings is neatly designed to offer one area that is perfect for a quiet read and another where there is flat screen satellite TV and DVD, Bose music system and computer (upon request) with internet access. It's all very homey and very comfortable with high quality furnishings. The kitchen and dining area is another super space, full of atmosphere, with a large oak dining table perfect for entertaining a full complement of 12 adult guests. Next to the kitchen area is a fabulous sun room, with a perfect green-baized full sized pool table that has witnessed many a late night of joviality and some competitive family instances. There is another flat screen TV here and some very comfortable armchairs. All the bedrooms are air conditioned, spacious and well-proportioned, with carefully chosen high quality fabrics and colour schemes. N.B. Pool is open and unfenced. The pool will be closed between mid-October until mid-April. Pool heating is on request (€200 per week), Max water temperature 26 - 27 degrees. • The gardens around the villa consist of a large area of lawn, with plenty of trees and attractive flower beds. There is an Italian boules pitch (bocce) and a very nice permanent BBQ with a large enough cooking area to be very usable for an assembled group on an evening. La Felicità is located in an area that is full of rare and beautiful wildlife: Hoopoe birds, woodpeckers, bee-eaters, kites and other birds of prey, fireflies, foxes, squirrels and wild boar are all fairly common. 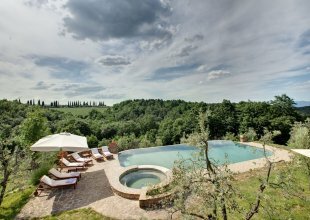 Surrounded by fabulous hill top towns and easy to get to places to visit such as the fabulous Volterra and San Gimignano. There are truly excellent outdoor facilities for spending warm summer days and balmy evenings and it's fully air conditioned which is always good at the height of the summer.